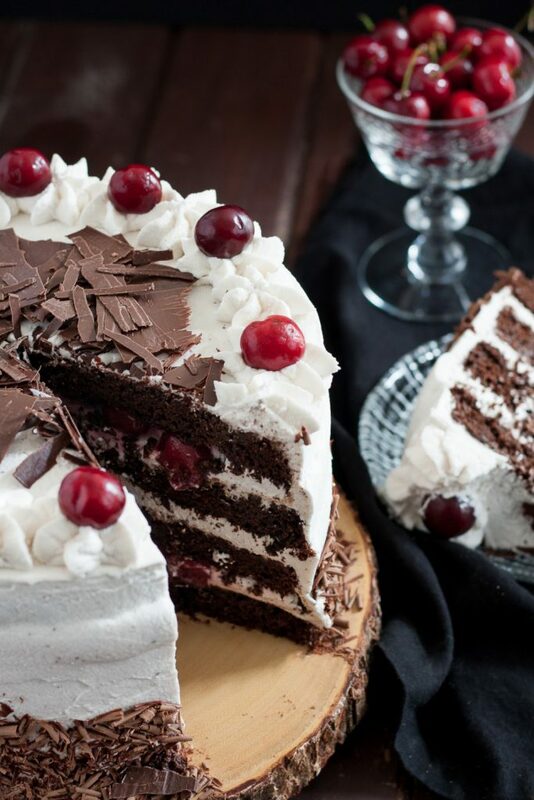 Black forest cake is a traditional German torte originating from a bakery in the Black Forest. This recipe is a more chocolate-rich version of the original. I developed a whole new appreciation for the original fairy tales by the Brothers Grimm last year on our trip to Germany. We drove through part of the Black Forest – the setting for many of the tales. It’s absolutely gorgeous, but a dense forest is not someplace I’d want to be alone after reading the tales! You know what I mean if you’ve read the original and not just watched the Disney movies. On our drive, we stopped in Triberg to hike a waterfall and try Black Forest Cake since that’s where the cake was originally created. No vacation is complete without a little dessert tasting, am I right? 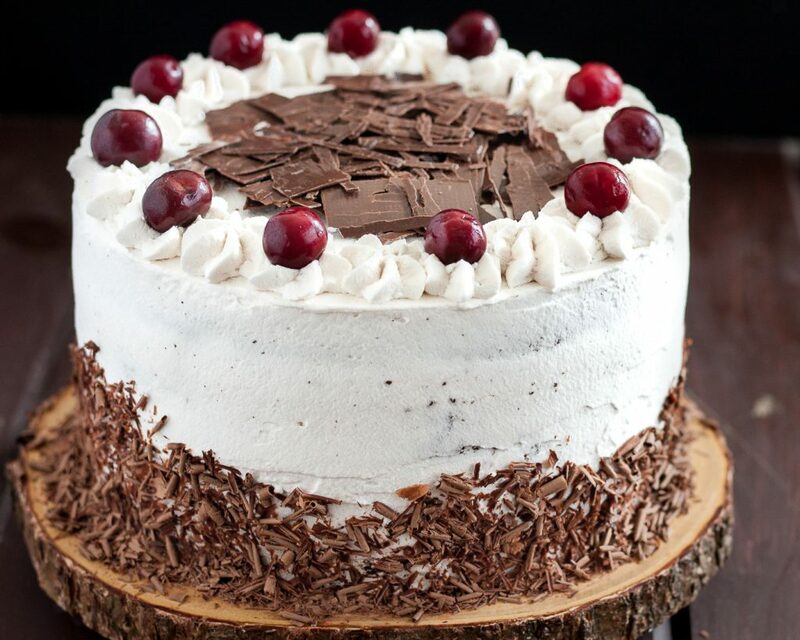 Besides, I wanted to know how “real” Black Forest cake tasted. And here’s where I might sound a little scandalous… we like this version better! The original has a very mild chocolate flavor, and you all know how I feel about chocolate in my chocolate cake. But it was good, and a few months after our trip I found myself wanting to bake Black Forest cake to pair with a German dinner. That is, as soon as I could find kirschwasser – the cherry liquor used in the cake. That was an adventure. Lucky you who live in states that don’t have an ABC. The Virginia ABC stores here have the strangest selection, and German cherry liquor (kirsch) for baking isn’t something either of the two local-ish stores carry. So I ended up with some other cherry liquor and results that weren’t quite as good. It’s worth hunting for good cherry liquor. If you can’t find it, or don’t want to use liquor, substitute the syrup from the morello cherries. These are the darker sour cherries (like this), not the bright red ones used for topping milkshakes or pineapple upside down cake. If you can’t find them, sour cherry pie filling is suggested as a substitute. 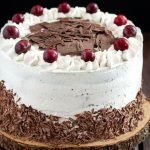 I hope you enjoy this Black Forest Cake recipe! In a large mixing bowl or the bowl of a stand mixer, combine the cocoa powder, flour, sugar, baking powder, baking soda, and salt. 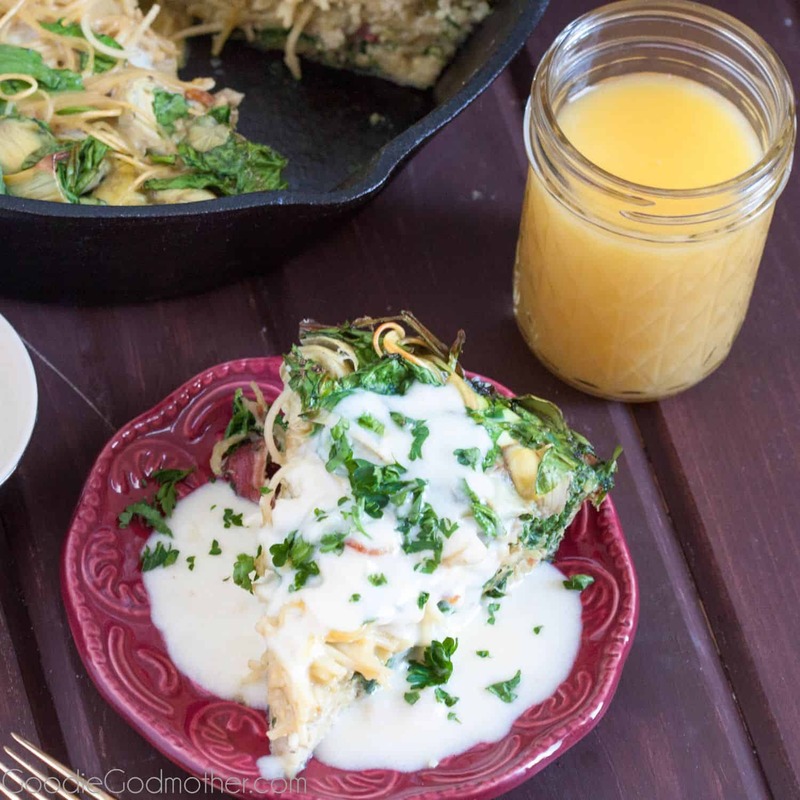 In a separate bowl, whisk together the buttermilk, oil, and eggs. Gradually beat the wet ingredients into the dry ingredients. Stir in the melted chocolate chips and mix just until well blended. Divide the batter evenly between the prepared pans. Bake the cakes until a tester comes out clean, about 35 to 40 minutes. Cool the cakes in the pans for 15 minutes, then carefully turn them out onto wire cooling racks to cool completely. 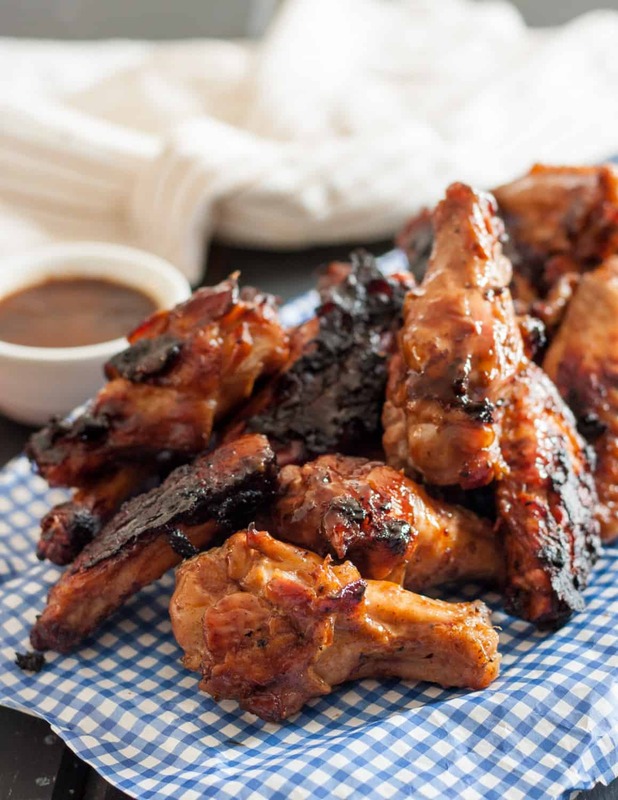 You may also turn them out onto plastic wrap and wrap well to either freeze for later (thaw in refrigerator overnight) or refrigerate a few hours until well chilled. TIP: Well chilled cakes are easier to level and frost. Remove the cherries from the syrup and set aside both the cherries and syrup - you'll need both! Make the whipped cream. Place the whipping cream in a large bowl and use either the whisk attachment on your stand mixer or a hand mixer to beat. Start at low speed, then work your way up to high, adding the powdered sugar and cherry juice as you mix. Beat on high until stiff peaks form, then stop and set aside. Use a long serrated knife or cake leveler to cut each Place the first layer on a cake board or plate and brush a coating of cherry syrup (or kirsch) over the surface. 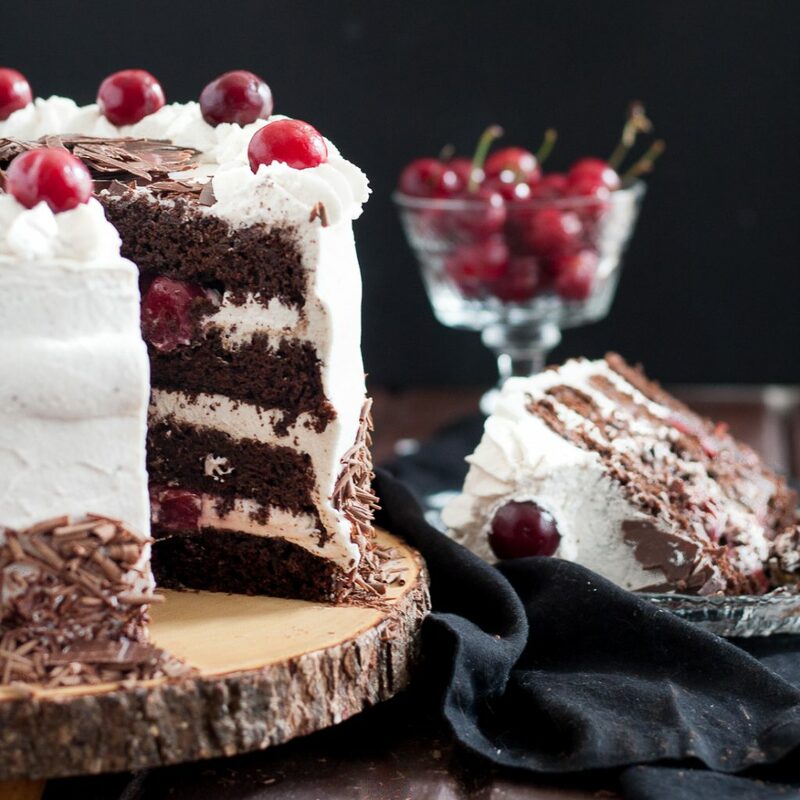 Spread about a 1/3" layer of whipping cream onto the cake and top with 1/3 of the cherries. Repeat with the remaining layers. Use the rest of the whipped cream to coat the sides and top of the cake. 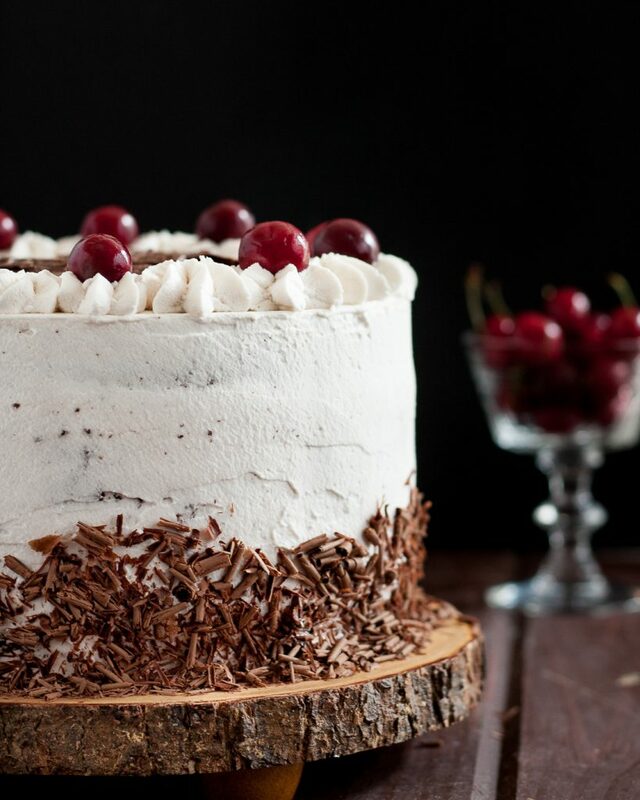 Decorate with the grated chocolate and fresh cherries (if using). Refrigerate the cake until you're ready to serve. Since this cake uses a whipped topping, it is best served the day it is assembled since the frosting will gradually deflate. *Use syrup/juice from the sour cherries as a substitute for the liquor if you can't find it or would like to omit the alcohol. I made this cake using a boxed mix which I enriched and then proceeded with the rest of the instructions. Let me tell you, this cake was the crowning glory of our Octoberfest dinner with friends! I’m so glad to hear this! And an Octoberfest dinner sounds like a lovely way to celebrate with friends! Is it to soak the cherries in first ? You would use it in place of the cherry syrup in the instructions, so brushed onto the cake layers before adding the filling. I updated the instructions for clarity. Thanks for stopping by! Hi mary! 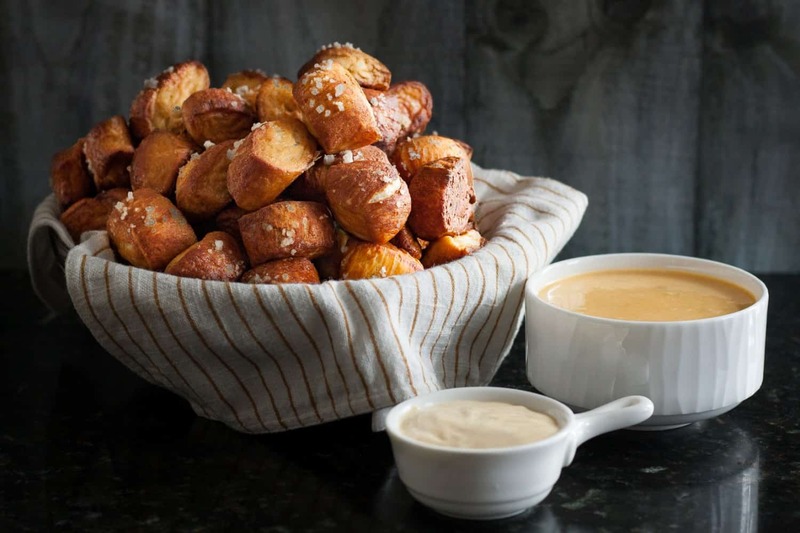 Is there a good substitute for buttermilk? thank you! Regular milk (even nondairy) can work. If you’d like to make a quick buttermilk substitute, add a splash of lemon juice or white vinegar to the milk and let it sit for 10-15 minutes to slightly curdle. That way it’s closer to buttermilk’s thicker consistency.